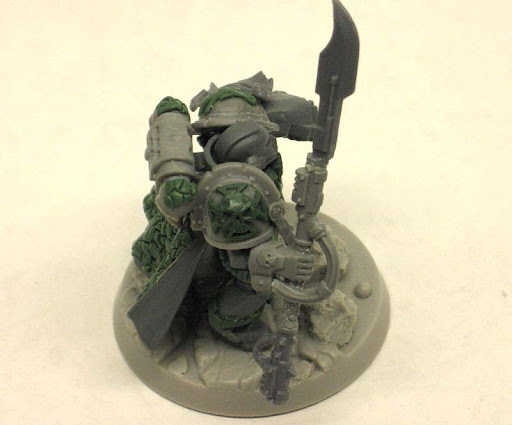 I recently finished a Vulkan conversion for a friend of mine. There were a good number of bits that went into this guy along with some extensive greenstuff work. I ended up greenstuffing scales on his cape, the trim around his lower legs, his front tabard, chest plate, belt buckle, both shoulder pad icons and some power cables that run along both arms for the additional equipment he's carrying. 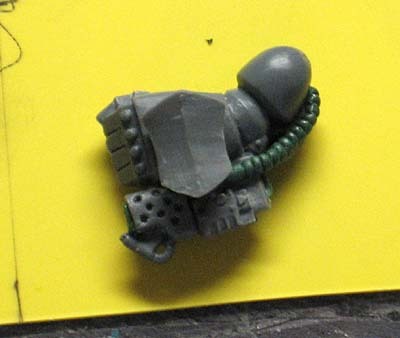 As far as bits, most people can probably recognize them but he started with the Commander boxed set and I used a loyalist Terminator Thunderhammer right arm along with the blade from a Chaos Terminator autocannon for his staff. The flamer/gauntlet was a little tougher to do. I used the front end of a flamer and the engine from a chainsword to make a "correct sized" flame thrower that mounted under his left hand. I tried a number of things that were too big before coming up with this solution. A greenstuff power cable completes the illusion. The base is from the lava line over at Dark Art Miniatures. 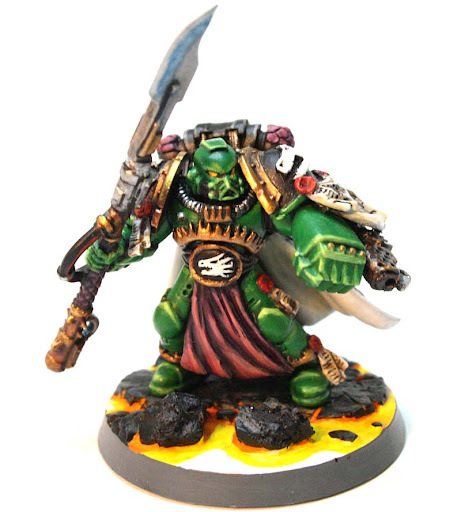 All in all he was a fun model to do and I think he stands out a little bit from the rest of the Vulkan models out there. There are so many out there these days, it can be tough to come up with one that stands out from the rest. UPDATE: I was sent this picture of the finished model by my friend. Great stuff Ron. the green work is exepctional as always. you can really be proud of this one!! The flamer arm is one of my favourite part allong with the tabbard/beltbuckle! Nice conversions and great execution! Looks great. I especially like the hand flamer. That's a brilliant idea for the flamer using the chainsword engine. Just curious - why did you switch out the termie shield for the banner? I think the shield looks much better. Now that is pure awesome. Great work Ron! 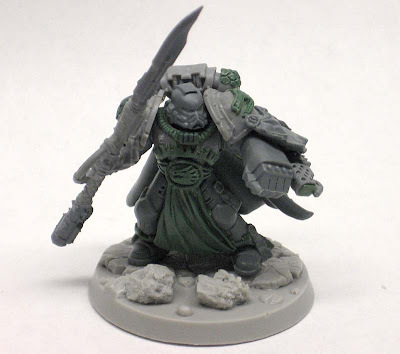 Great conversion, lots of clever bits usage and you've sculpted the symbols perfectly. Especially the wonderful belt buckle one. That is superb, and i'm sure will look very special when it's painted! Great Work! 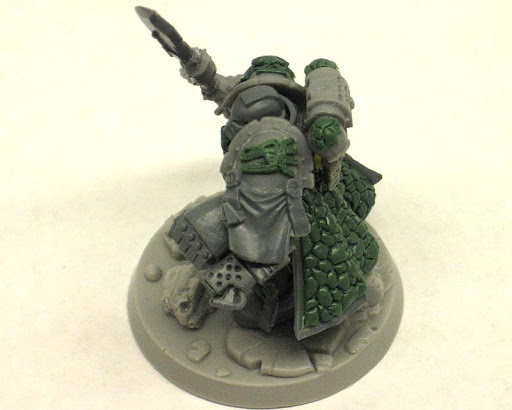 Wow, I've been looking for ideas for this conversion (I've ordered the GW model too). Your's is the best I've seen. That is fantastic especially th gs!!!! Wow, much prefer this to the GW model! Tristan: The switch from the shield to the scroll was based on visual weight. With the shield on his arm, it was huge and a bit akward looking when compared to the ret of the model. However, the scroll fits the bill nicely and adds some detail to the arm overall. With all the additional gs work, it was a delicate balance between open, clean areas and cluttered, highly detailed spots on the model. Very very nice. The work done with greenstuff is brilliant! Excellent conversion. I love the shoulder pads and flame iconography, very well done! That is pretty amazing. I like it better than the actual model. where is the blade from by the way? Great sculpting, I agree with those above - a nicer model than the 'new' vulcan - who like the Pedro model, lacks something in pose and style. You can see what they wanted the model to say - I just don't think they nailed it. chou_man: The blade comes from a Chaos Terminator autocannon. One of those things I had in my bits box from a previous project that fits perfectly with the model and gives him a unique looking weapon.